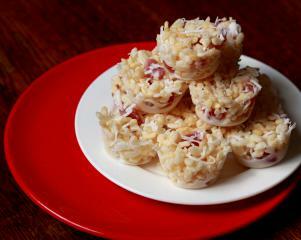 These sweet coconut treats look and taste like christmas. Makes 24 in a mini muffin tray. Finely chop the cherries. Using a blender or a food processor take the 3/4 cup of coconut and blend it until it turns into a dough like consistency. Melt the copha in a small saucepan over a low heat. When it is completely melted remove from the heat and stir in the blended coconut. In a bowl combine the rice bubbles, remaining shredded coconut, cherries and icing sugar. Pour the copha over the mixture and quickly stir it in. Press the mixture into a mini muffin tray and refrigerate for about an hour until they are hard. Lever them out of the tray and they are ready to serve. They will keep for about a month.